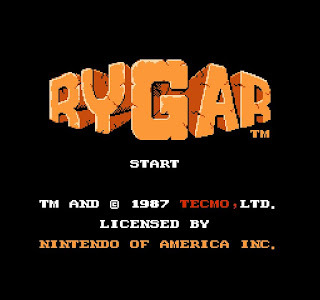 Rygar was originally released for arcade platform in 1986 by Tecmo. 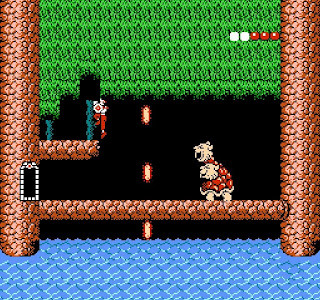 The NES version released in 1987 is a totally different game than the original Rygar and includes the role-playing and adventure elements in to it. 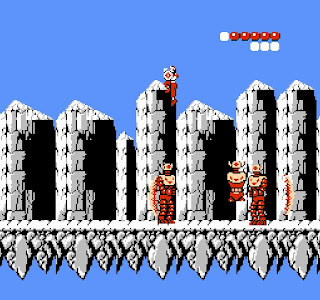 It is by far one of the best game for NES that keep me replaying from time to time, even until today! 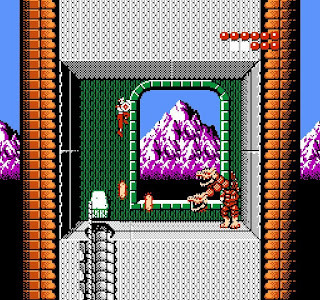 In Rygar, we will play the legendary warrior Rygar. Our grand purpose is to kill the grand villian staying in the Sky Castle. Of course, there are some works to be carried out before we are able to reach Sky Castle and meet the final boss. The works that we need to do are gradually build up our "Tone" and "Last Mind", kill all bosses in the land, release the god-like men prisoned by the evil bosses and collect six sacret items kept by them. At the beginning, we have only 30 "Tone" and 10 "Last Mind". They are some sort like the experience point in other RPG games. We will earn the points every time we kill a monster. The more we have, the stronger we become. We begin the game at Sueru Mountain. Our first mission is to get the Grappling in Garloz valley. With Grappling, we can reach higher platform by throwing it and hang it on the platform. To reach Garloz, we need to get pass Gran Mountain. There are quite a number of fast moving monsters like below to block our way, and do post some danger as we are still weak in the beginning. After some travelling, we will reach Garloz. You can refer to the map that I've included in the package to find where to get the Grappling. This is the only sacret item that we can get without fighting a boss. After that, we will proceed to get the second item, Pulley. With Pulley, we will be able to slide over ropes to get pass some valleys or mountains. To reach there, we need to get pass Rolsa and Eruga's Forest. The boss of Eruga's Forest is a double-head turtle that can fire three shots periodically. To be able to defeat him, we must have around 5-6 life slots. After defeating the boss in Eruga's Forest, we will be rewarded with Pulley. Next, we need to obtain Crossbow in Den of Sagila. 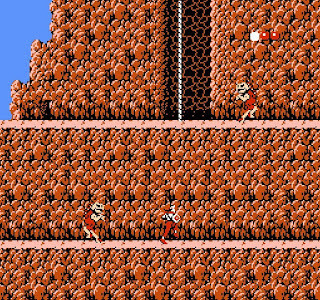 Before reaching there, we need to fight through Primeval Mountain. It is one of the hardest part in the game as there are a lot of monsters, both ground and airbound, coming non-stop. After the tough fight in Primeval Mountain, we will reach Den of Sagila. 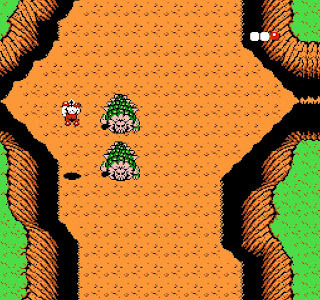 To reach the boss, we need to get pass the calmful Primeval Mountain Sunset and jump over a number of ghost fire. 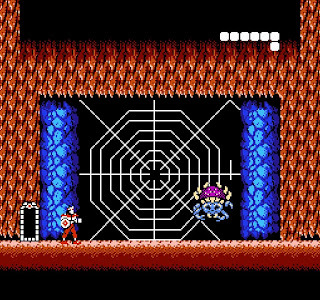 The spider boss is kind of easy to be defeated. Just hide in the right corner and he will not be able to harm us. With Grappling, Pulley and Crossbow, we are now able to reach all places in the game. 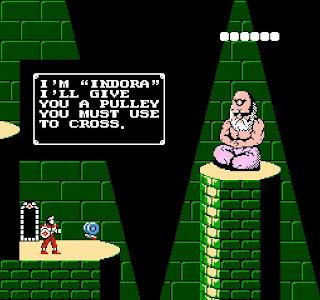 Normally, I will go to The Palace of Dorago to obtain the Indora's Suit of Armour as it is the nearest to the Den of Sagila. The Palace of Dorago is a dangerous place to go as there are many furious monsters inside. 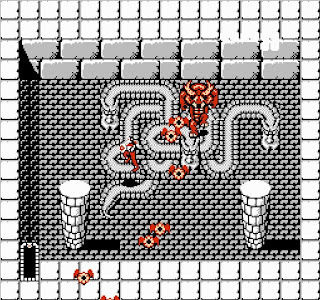 Normally when we reach the palace, we will have only 7 life slots, which will be easily gone if we are not careful enough. Dorago himself is not difficult to be defeated. What we need to do is jumping from left to right and hit him while jumping. After beating him, get the Indora's Suit of Armour. This item give us no special power, but it is a requirement for us to reach the Sky Castle. Next, we will go to Lapis to get the Coat of Arms. 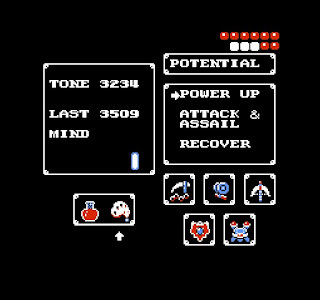 At Lapis, we can spend some time to kill the robot monsters as they will give us a good number of "Tone" and "Last Mind" points. Once we grow until we can beat them with one hit, we can move forward to face the boss. By defeating the tree like boss, we will get the Coat of Arms. With Coat of Arms, some god-like men hidden in the big tower will give us Life Potion to restore life when needed. Now we will go to get the last item, Flute of Pegasus. 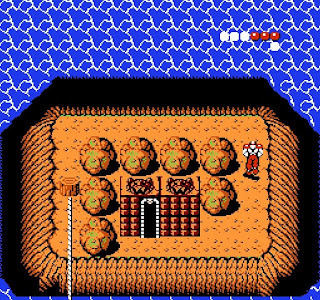 Flute of Pegasus is kept in The Tower of Garba located at the top of Gran Mountain. 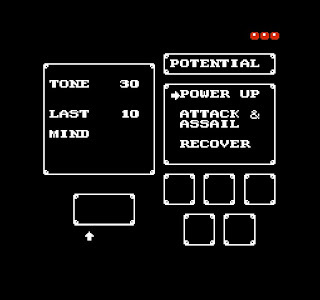 Inside the tower, we will meet a number of boss-level monsters and the double-head dragon boss. 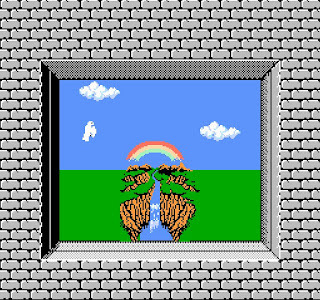 By beating them, we will get the Flute of Pegasus, the last item required to reach Sky Castle. By this time, we should have full accessories like below. To reach Sky Castle, we need to go to Rolsa, climb to the highest part where we can see the Sky Castle floating on the sky. When we are there, sound the Flute of Pegasus and the door to the Sky Castle will open for us. 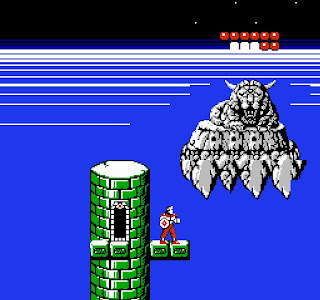 There are a number of shadow monsters inside Sky Castle, which can still harm us even though we are quite strong now. Luckily, there is a god-like men in Sky Castle that can give us the Life Potion. 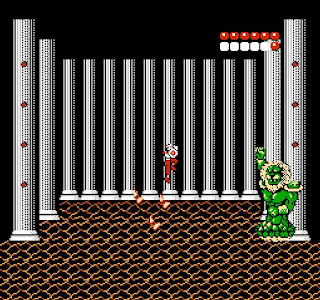 After travel for some time, we will reach the palace and meet the final boss. With our strength at this moment, defeating him should be an easy task. And it is, after killing the final boss, the game end. Enjoy the victory music specially composed for us. 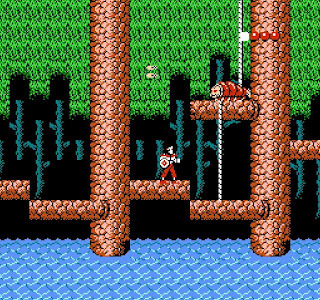 You can download the original NES version of Rygar here. The full Rygar maps are included in the package as well.